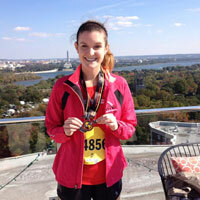 Race Recap: Marine Corps Marathon | Fit Girl. Happy Girl. Wow that is so awesome! Congrats…I can imagine the “magic” of the marines and festivities were motivating! Thank you! It was an incredible race! Congrats on such a huge PR! There definitely must have been some contagious marathon magic in the race because I had an awesome race as well. Finished my first marathon in 4:26 and felt like I ran it really conservative for fear of the wall and a desire to just enjoy the experience. Now I know I can run faster in my next. But it was a blast! And seeing Bart at mile 25 1/2 was a huge boost for me. He yelled my name (it was on my shirt) how cool! 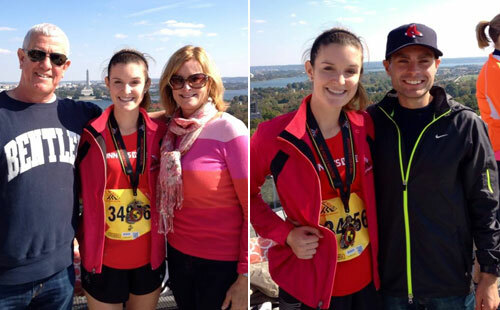 I’m so, so happy to hear you had an incredible first marathon experience! I know you can run faster too. You’re going to get addicted!! Thanks, Ani!! Marathon magic is real that’s for sure. Wow! Congratulations – that’s an awesome PB! I finished my first marathon in 4:32:01 and having now completed 4 marathons, I’ve only managed to get the time down to 4:29:33. I’m doing another marathon in April, so I’m hoping to do some speedwork in November before starting to train again in December. Maybe if I can start picking up the pace now, there’s more hope that I’ll get sub 4:15 in Spring. I’ve managed a 1:52 HM and have done 20 miles in 3:02, but the marathon eludes me. What are your top training tips? Thank you! I need to write a post about my training tips but for me, the main key to training is stick to a plan, but listen to your body. If you’re feeling achy or sick, take a rest day. Having a plan really helps though! Which marathon did u like best? Where will you run next? I loved them both for very different reasons. I thought Big Sur was perfect for a first marathon because the course is so challenging there’s no pressure for time. It’s also very peaceful and the views are incredible. I loved MCM though for the spectators and the faster course. It helped so much having spectators along the course! I haven’t nailed down my race schedule yet but I’m hoping to do a fall marathon. Thanks for the feedback. I will keep Big Sur on my list! Thank you so much Meg!! It definitely helped having the experience from my first marathon to get me through. Can’t wait for number 3! Just a note to join the chorus: Congratulations! Congratulations! I’m so glad you were able to meet your goal. I’m so glad the plan worked for you…I hope it works for me on Sunday as well as the marathon magic for my first marathon! Thank you!! Best of luck at your first marathon and enjoy every minute of it!! Oops, sorry, posted that too soon! I totally believe in Marathon Magic, my legs felt so tired and my arch was killing me leading up to MCM, but come race day I felt amazing! I PR’d also and even ran a 9 min negative split! It was such an amazing race from the course, to the weather to the amazing Marine support I loved every second of it! Thank you!! Huge congrats to you as well! A PR and a negative split is so huge!! Thank you! I totally agree, the hardest part is getting to the start and then the magic happens! Congratulations on the huge PR, and crushing even your secret goal time. I like the recap of your favorite parts of the race. 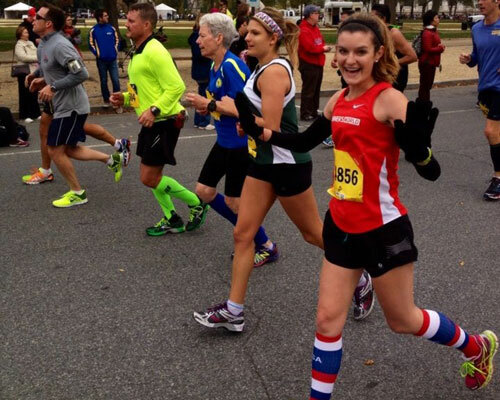 And I love that happy photo of you at mile 18! Way to rock it! Thanks so much Kristen!! It was an amazing race! Congrats! You did such an awesome job and I’m so proud you set a PR. Also where did you get those amazing socks?? Thanks Jamie!! The socks are Pro Compression and I got them around the Fourth of July. Absolutely love them! Congrats on your 2nd Marathon and the PR. I have a hard time doing the mile by mile thing also. Some people have incredible memories, not me. Thank you!! Glad to hear I’m not the only one who struggles through race recaps! Thank you so much and congrats on your PR too!